Well I dpn´t want to spoil all the stories for when I get home but I would really like to share the amazing day we had last Saturday in Rincon de los Sauces. I really was such a great experience. We met with the familia Ponce and the familia Bogado. So just a little background. The Familia Ponce was baptized in Santa Fe about 20 years ago. Hno Ponce was in the high council and everything but then he moved to Rincon 12 years ago where the church doesn´t exist. 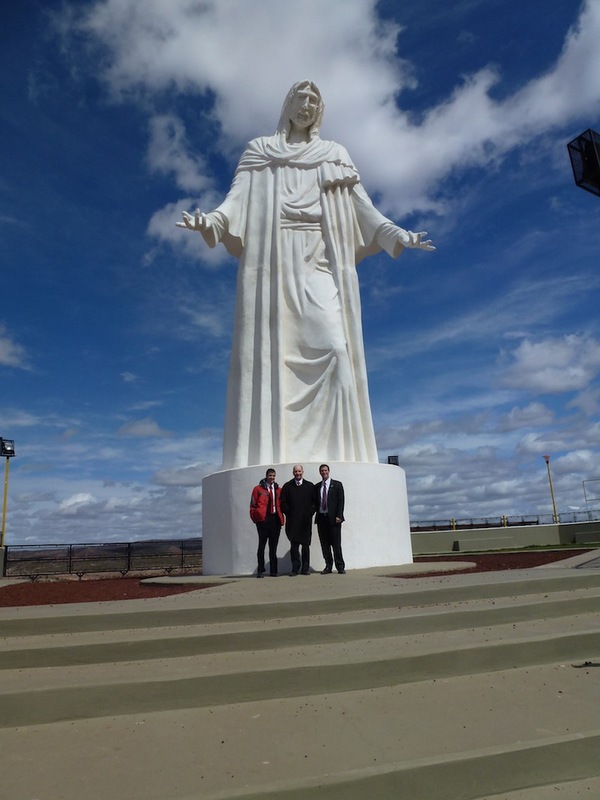 They go to church every once in a while to Neuquen where they have a daughter living. But it has been 12 years where there has been no church but he still tells everyone that he is Mormon. So 12 years without a visit from missionaries and we were able to make that visit on Saturday. I don´t think I have ever seen a family so happy to have a visit from missionareis. It really was a great experience. We were also with the Familiy Bogado who is a former bishop from Buenos Aires who has lived in Rincon for about 2 months now. Hno Bogado told us that we were the first missionaries to ever be in Rincon. That really was a cool thing to be a part of. Both Hno Bogado and Hno Ponce took us around the city and we were able to see everything. Its a cool place and reminded me a lot of Utah to be honest. We talked to them about puting together a branch of the mission out there and also puting 4 missionaries there. And like you guys found out we are getting 58 missionaries this transfer cycle so that will probably be really soon when we will see some missionaries in Rincon. It really was an experience that I was so greatfull to be a part of. The faith that these members showed has really been a testimony builder for me. Being a missionary really is awesome! Well I´m really excited to see you all this coming week. I love you all! This is a statue of Christ that looks over Rincon. A picture with the Flia Ponce and the Flia Bogado. 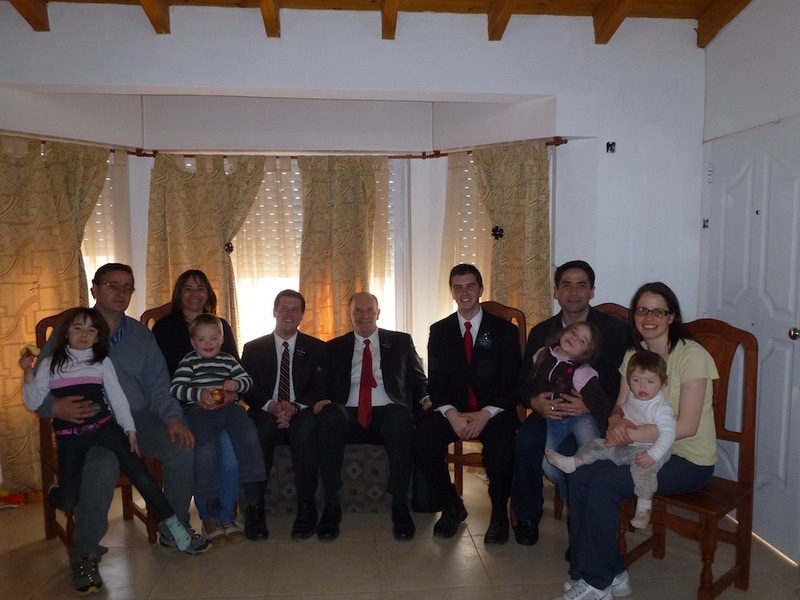 Flia Ponce and the Flia Bogado with Elder Hudgins, Presidente Lovell and Elder Wagstaff. Here is one with Elder Wagstaff on a lookout. 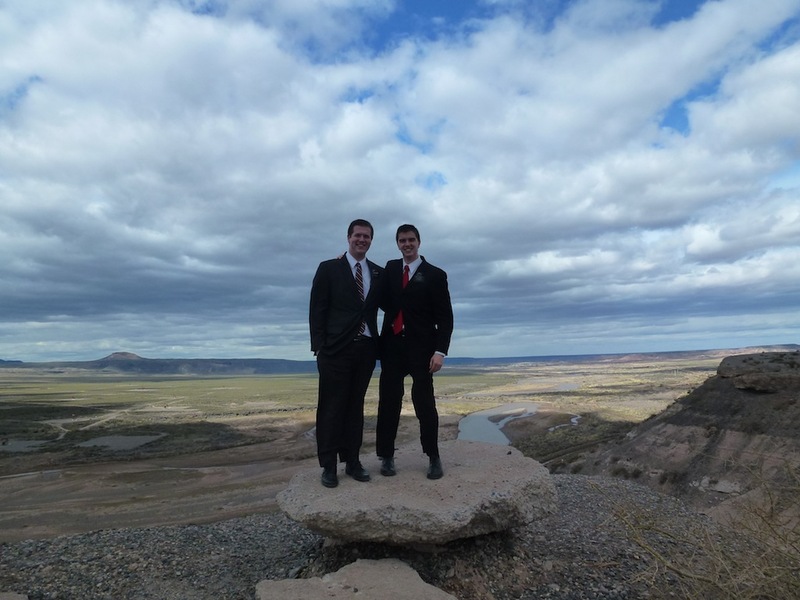 Behind us is the povence of Mendoza. Hello everyone back at home! Thank you all for the wonderfull letters! Well this sure was a great week and a crazy one as well. Well I guess now you could say that that is pretty normal. But this week we finished all the interviews so now we can actually focus on the work in the area a little more. Its fun getting back to normal a little bit and teaching people. We had a lesson with the Rios family and they are doing great. They really are progressing well. Hermana Rios is really having a lot of trials but she is doing great and staying strong. They really are being blessed for all the things they are doing. Its really great to see that in them. This week has been pretty fun because we received 3 new missionaries in the mission. All three of them were waiting visas and now they have finally come here. Its great too see new faces and also to see people that are really excited to be here in Argentina. We started doing transfers this week. It has been a little tough. It is the biggest transfer that this mission has ever seen. With all the new missionaries coming and also with the visa waiters coming there are 41 new missionaries in the mission! That is crazy! There are only 5 missionaries that are going home this transfer so we almost don´t know what to do with so many. We are already opeing 12 new areas and all that so we most likely will have to start doing some trios. Today we are also going to Rincón de los Sauces with president which is a place that missionaries have never been. President has been in contact with a former bishop from Buenos Aires that recently moved there for work. He has been in contact with a couple other members there in Rincon. Also this last week a man stopped us on the street. His name is Juan. He said that he has been member for his whole life but about its been about 10 years since he has been to church. He was living in Rincon but now he is here in Neuquen. But he has 3 kids and his brother, who is a member, who all live in Rincon. Juan came to church this last week and we had a visit with him in his home this week and he really liked it and is really excited to return to the church. He is going to be in Rincon today and we will meet up with him to meet his family. So it should be a pretty fun day. With all these new missionaries we are in a position to put missionaires there in Rincon so hopefully we can get something started up there soon. It really is an awesome experience seeing the expantion of the church like that. Its an honor to be part of it. It really is the fulfilling of many prophesies these days! Well we are leaving this morning at 9 so I don´t have too much more time but I love you all! Good afternoon family! Well I guess everyone is getting ready for the BYU Utah game right now. I hope it is going well for the Utes. Well its good to hear from all of you this week. It really has been a crazy week with lots of traveling but it sure has been a lot of fun. We started our trip on Satruday night and didn’t get home till late thursday night. It was fun. We has a lot of fun in Barioloche where the president took us to see the Llao Llao hotel which is super nice. It was also fun just too see all the scenery of Bariloche. It really convinced me that Bariloche is a can’t miss place to visit if we come back to argentina. Also when we made the trip from Bariloche to San Martin de los Andes we took the 7 lakes route which is just amazing. We passed through Villa la Angostura which we are hoping to open this coming transfer and boy that is seriously the prettiest place ever. I would love to be the missionary that opens that little town. But the trip was going great until the last day when we were traveling home from Zapala. I´ll tell you the story. So here in Argentina at all the gas stations there are people that fill up your gas. So one of the guys I guess messed up and put gas in the hilux and not diesel. So we got about 30 Km outside of Zapala and the car broke down. So we had to wait 3 hours until elder Ehmke could come out and meet us. We got a tow truck and it hauled the hilux to Neuquen but we didn´t get home tilll 12:30 that night and then we had to wake up bright and early to go to Roca yesterday so it has been a tiring week and this morning my body just kind of gave up and i was just really suffed up with a huge head ache and with a cough. So today Elder Wagstaff had to do all the training by himself because Hermana Ehmke said that I needed to stay home to get some rest. Hopefully tomorrow I will be a little better and also for Monday and Tuesday for our last two training meetings. So on Satruday the Baptism was great. There was a lot of support from the ward. The youth and the primary prepared a musical number so that was great and there was a good showing from the ward. The Ehmke’s have also helped a ton with the familia Rios, having family home eveing with them and checking up on them while we have been gone. It sure was great to see the kids get baptized and also Hermana Rios was also very happy. Its amazing how much she has changed over the course of the last few months. It is something that I am really great for for to be a part of. Well I hope you all have a wonderfull week. I love you all! 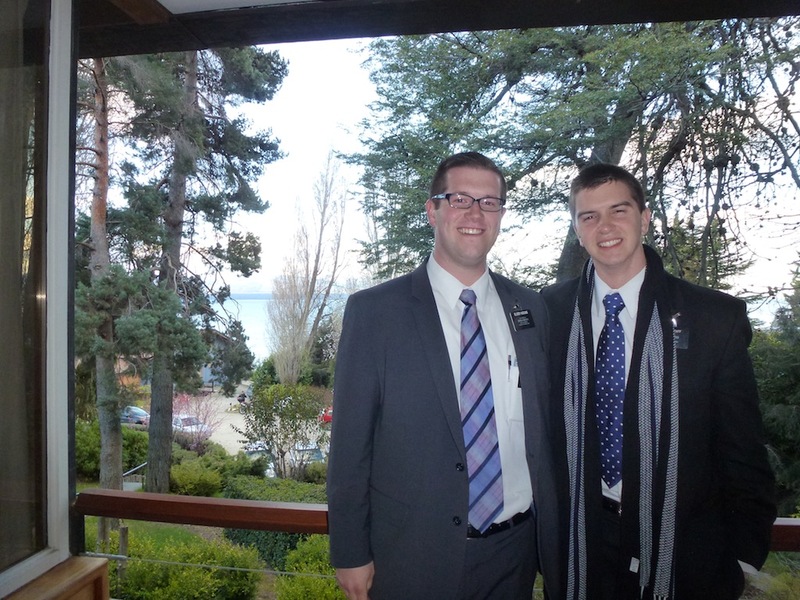 Here is a picture of Elder Wagstaff and I on the balcony of President´s hotel in Bariloche. After the interview in Zapala we had luch with Guille and Laura. It was great to see them again. Back: Elder Hudgins, Elder Wagstaff, Guille Venegas, Presidente Lovell, Elder Peterson. Front: Daughter, Laura Nahuel, Hermana Lovell, Elder Suarez. Here are two really great friends Elder Sasine and Elder Vizcarra. They are the zone leaders in Bariloche. 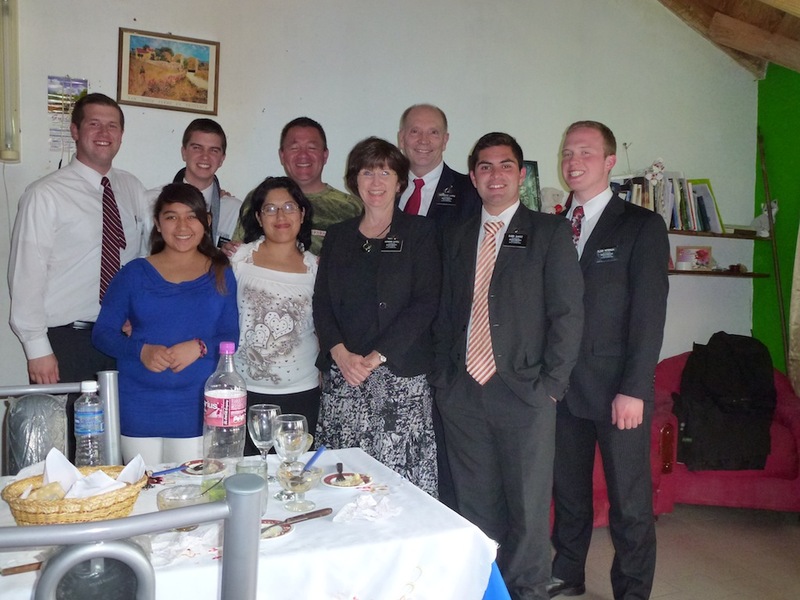 Elder Wagstaff and I were there zone leaders in Zapala. 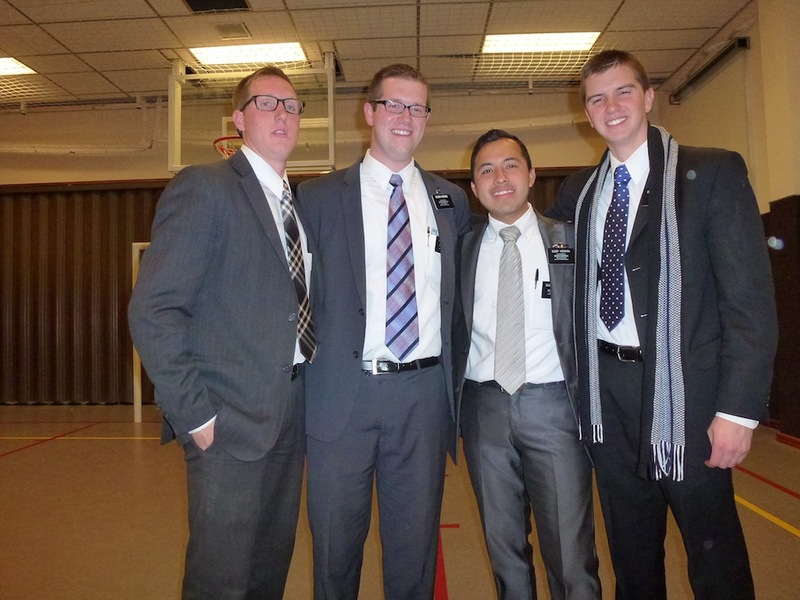 Elder Sasine, Elder Hudgins, Elder Vizcarra, Elder Wagstaff. Hello everyone! Thank you all for the great letters this week! It was great to hear from all of you. So this week has been a pretty fun one. A little more tranquilo than usual because president wasn´t here during the week. So it was nice to focus a little more on the area and especailly the baptism we have today! Lourdes and Francisco will be baptized today at 7. 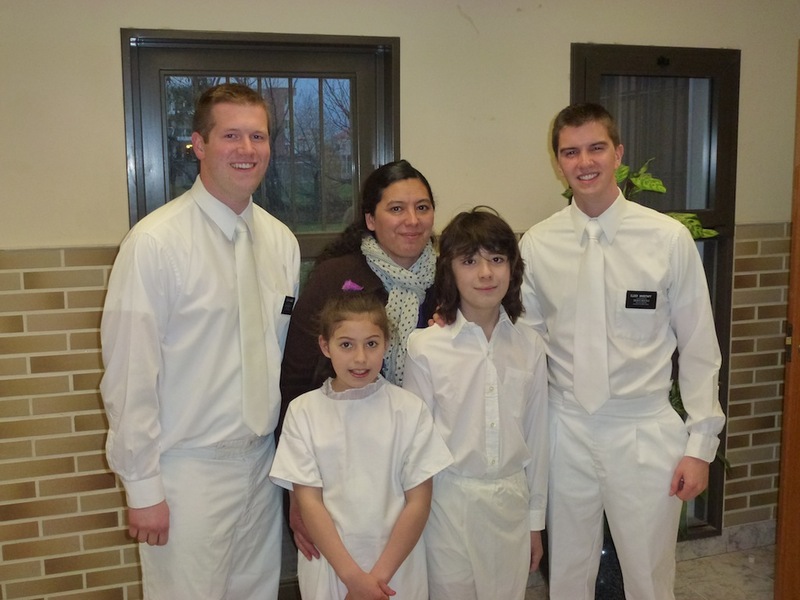 Elder Wagstaff is baptising Francisco and I will baptize Lourdes. It was be a pretty great service and we are super excited for that. Its been amazing to see how much the lord has prepared this family. The hermana before was not very interested in the church and always thought that the church just brought more problems in her life. But she has totally changed and you can see the difference in her. She starts baring her testimony when we go there and it really just an awesome experience. We are really excited for the baptism tonight. So while we were really focusing on that we also had a lot of little busy things that we had to do. We received another missionary this week that we had to go and pick up and also we had to go and make a trip out to Allen to bring some crutches to and elder over there. Its just some little things that we always have to do as AP that just seem to get in the way of a lot of things. But its all really fun. So this week we will be going on the gira as they call it here on the mission were we go and visit all the zone. The president is going to be doing the interviews and we will be doing some capacitations during that. We will be talking about all the new key indicators and how to help plan to have the help of the members. We are calling them war plans and we are using a lot of the scirptures fromt he war chapters about how they planned their attacks and came out victorious. It will be really fun and also a last time to see all the missionaries in the mission. So we are pretty excited about that. We are leaving tonight on a bus going to esquel but we will be stopping in Bariloche to go to chuch tomorrow so that will be fun. So everything here is going great. Tell Jordyn and the rest of the family that I say hi and I will be sure to include them in my prayers. I´m really having a great time and just enjoying the time. I love you all! Thank you for everything! Hello family! Well we just finished a week with a whole bunch of new changes for the mission. there sure is a lot of excitement going on around the whole mission as well. While we were talking with president this week he was really concerned with the member involvment so what we decded to do was to take out all other lessons and contacts. All now for a lesson to count we have to have a member present. Its going to be great because it will help the missionaries focus more on getting the help of the members. It will be fun to see all the results. This week we continue to see progress with the family rios. They are set to go to church on sunday and be baptized in the next week. Last night we also invited Monica the relief society president to go invite her to church but she told us that she already did so that was awesome. Its great to see the members already doing these things. So things are looking great for the baptism. So right after the baptism we will be leaving to go do the trainings for the interviews with president. So that will be fun and keep me a busy week. So I´m sorry to hear about Jordyn and her eye. Hopefully all turns out well. At least she still has her sense of humor from that video. That gave me a good laugh. I hope all is going well at home. i love you all and hope you have a wonderfull week! Well this week sure was a crazy one. With a lot of headaches but also with a lot of really fun experiences. It really was a challenge handleing all those missionaries but I think everyone had a great time and got really excited to be a missionary here. It will be amazing to see the impact of all the new missionaries on the mission. It makes me really excited for the future of the mission. So this week we havn´t been able to work much in the area but last night we were able to have a lesson with both romina and matias and also with the familia rios. They are both doing really well. With matias and Romina they really don´t have any plans to get married. Their relationship is really distanced and they aren´t living together but they have worked out a lot of things. So who know maybe she can still get baptized. It will be an interesting situation so we will have to see but Romina said that she is pretty sure that these things are true. So its looking really good to be honest. The Familia Rios is still doing really well. Last night the hermana was a little upset with the kids not doing very much around the house. So we made a chore list with them to help their mom. We also committed all of them to go to church and they we all really excited. So the kids are looking great for the 14 with is awesome. The mom is less active and she hasn’t been to church in about 5 years so that will be really cool to see her there. So this week should be a little more tranquilo so we should be able to focus on the investigators this week so that will be really nice. Well I hope everyone is doing really well back at home! I love you all and hope you have a wonderfull weekend! Well this week sure has been a crazy one with transfers and all that. Its been a little stressfull in the office but hopefully it will be a little more tranquilo afterward. With the transfers we weren´t able to get out in the area as much as I would have liked but we were able to keep going by the Familia Rios. Last week the two kids went to church and they were making friends and everything it was great. We went with the Ehmkes who are the matrimony here in the office. They really helped out with the lesson. The hermana ehmke brought her some skirts so she could go to church this week . They really are progressing really well and also the Hermana. We comitted her to go to church this week and she said yes. She says that now she wants to be more open with the people so it seems like the Lord really has prepared her. So the kids are going well for their fecha for the 14 of september. Well I thing today we are going out to luch so that will be fun. Its a place called the boliche and its a super good asado place so that will be really fun. I´m not quite sure what else we´ll be doing but I´ll make sure to take some pictures. I hope everyone is doing well at home. The week sure is going to be crazy here with all the new missionaries coming in. This week we have been really hectic becasue we have to find a whole bunch of new apartments and buy all the stuff for that and so its been crazy. But it will be really fun when all the new missionaries get here. I love you all and hope you have a great week! Here is the picture with all the birthday cards. Thanks to all the primary for the wonderfull cards!!! Well hello everyone back home! Its been a really fun tranquilo week here in Neuquen but also a fun one going around and doing some intercambios with the elders. One Monday we were able to go out to Roca. It was my first time out there really. On monday night we went to a baptism for the zone leaders there. Its was a really amazing experience. The investigator´s family has been members for quite some time now but the dad never got baptized. But he finally dicided to do it and monday was his wife´s birthday and it was a surprise for her. She didn´t know it was her husbands baptism she was going to until he walked in as the service started. It was a pretty amazing. On tuesday we did intercambios with the elders in Roca. I was with Elder Hunsaker and we had a lot of fun together. We had a really good day with a lot of success so that was cool. This week we have been focusing a lot on finding new investigators because the investigators we have now aren´t progressing as much as we would like. So we have been going through the area book and we were able to find a couple of really cool people. We have some appointments tonight so that exciting. Last night we also went to teach a contact we made the other day. We found out that he is a member. We asked him if he had desires to come back to church. He said that he wouln´t have let us in if he didn´t. He has a wife and two kids that are 10 and 1. We started to talk to his wife a little bit but she has to go because the little daughter was beeing a little fussy. But he committed to come back to church. He is really excited about it. So hopefully now we will be albe to help all the family come to church and know about the gospel. So we wern´t able to any of the transfers this week because we found out only yesterday how many missionaries we will be getting this next transfer. But we found out we are getting 28 missionaries. What the crazy thing is that there are now missionaries leaving this transfer. So that means we are opening a ton of new areas! So thats the cool news thats going aroung the office. We are really excited about it. Well I love you all and hope you have an amazing week! I´m sorry about the lack of pictures I have been really lazy about it. I´ll repent. I love you all! Wow thank you for all the great pictures! 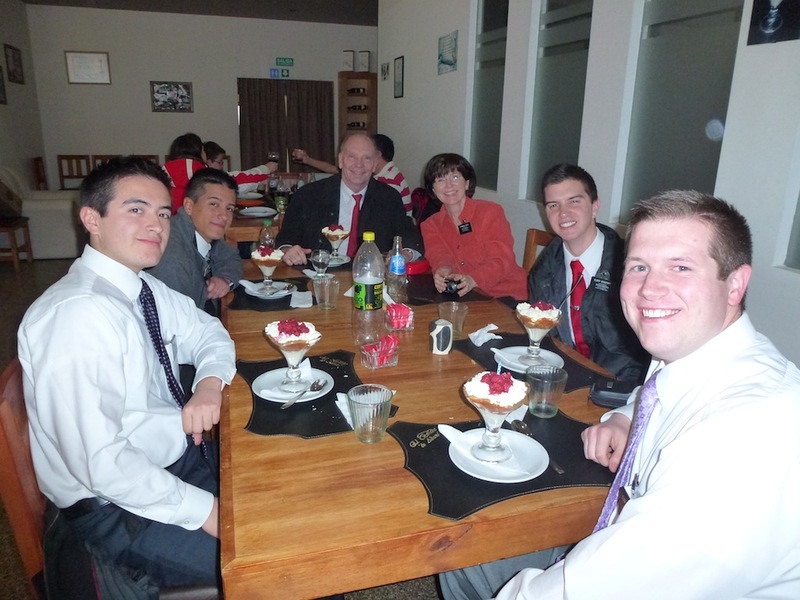 Looks like you all had a fun filled weekend and those pictures were awesome with Elder Wagstaff´s mom! Thank you! Anyway this week was a pretty fun one and it sure just flew by really fast. So this week we had exchanges with the zone leaders in Neuquen. I went with Elder Mena from Mexico. 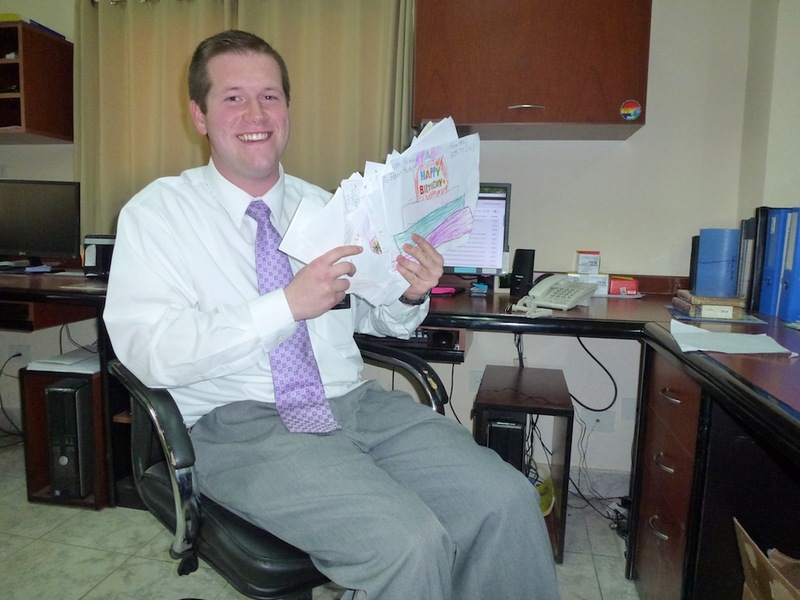 Elder Mena really is just a really awesome missionary. He only has like 8 months in the mission and it was really fun to go out and work with him. But man was that really a rough day we had together. We had a whole bunch of plans for the day. We were able to go by every single one of them and they were all home but for one reason or another they were able to sit down with us. So it was a long day of walking around just trying to find someone to teach. It was rough but we had a good time just trying to find something to learn from the day. Even though we had a bad day number wise we both felt satisfied with our work for the day. Well this week really was another successfull week. I really like the things that we are seeing in the area and I hope it continues to get better. I´ll start off with Maitas and Romina. They really have been going through some struggles this week. They got in a couple arguments and there was a lot of tension in our visit with them on thursday. We talked about faith and how they need to have the vision that they are going to be able to overcome their weaknessess through Jesus Christ. It was a very spiritual lesson and I think it went very well. They were able to go to the registro civil to put a wedding date for the 31 of August so that was a huge step. But they still have a ways to go but I know that they can do it if they follow through on their committments. This week we were also able to put a fecha with a man named Julio. He is a really great guy. He has a family but he was alone when we found him. We talked about following christ though baptism and he accepted really willingly. We are really excited to teach this family. Hhe said that he would go to church this sunday as well so thats really cool. We have a cita on Monday and we hope the whole family is there. I love you all and hope you are enjoying these last few weeks of summer. Iove you! It seems like yesterday we were waiting in anticipation for Kyle’s travel itinerary to leave the United States for twenty-two months in Argentina. We waited anxiously for that email letting us know when he would leave and finally received it nearly two years ago. This evening we received Kyle’s itinerary to return home after serving honorably. It made it sink in, that he truly will be coming home shortly. We can’t wait to see him return but also will miss the weekly emails that have brought us such great blessings.